The CRKT Ikoma Sampa designed by Brazilian knife maker Flavio Ikoma is dubbed a “gentleman’s tactical folder” by the fine folks over at CRKT. If I had to give this blade a one line review, I’d say CRKT pretty well summed it up themselves. The Sampa was primarily designed by Flavio Ikoma, although it picked up a little international flavor from long time friend and blade brother Ken Onion, who apparently provided some insights that Flavio incorporated into his final design. The Sampa is somewhere in between a compact and medium length folding pocket knife. With the overall length of 7-1/4″, a 3-1/8″ blade, and a weight of 2.7 ounces, the Sampa is super slim in hand, and has a featherweight feeling in pocket. I would call the blade a semi-drop point shape. The AUS 8 stainless steel blade features a slight recurve, and a very shallow hollow grind. The blade was razor sharp out of the box and my model 5335k is equipped with a short run of triple point serrations. I like how this combo edge isn’t taken up by tons of serrations. It is a nice balance offering serrations when you need them, and razor sharp goodness when you don’t. Something that really sets the Sampa apart is the unique handle design. CRKT started with two slabs of T6 aluminum, machined an intricate series of grooves and hashes, and then gave the handle both a blasted and polished finish, that kind of looks like titanium. Although there are many deep cuts made into the handles, I found there were no sharp edges or uncomfortable areas when gripping the knife. The handle is fairly smooth and offers generous finger grooves for positive traction when the blade is locked open and ease of handling while deploying the knife. Despite this being a thin handle, it is still easy to get a good grip on this knife, and I don’t feel like I’m going to fling the Sampa across the room when I flick the blade open. The pocket clip is interesting. It is mounted for right side tip up carry and rides low in the pocket making it well concealed. The clip becomes wider near the opening and easily inserts into the pocket – no matter how flimsy the fabric is. The downside to this style of clip is that it easily gets caught up on stuff. In the few months I’ve carried this knife, I have managed to accidentally catch and bend the pocket clip outward at least a half dozen times. Fortunately the clip can easily be removed with a small torx head driver and the clip can be bent back to its original position. Deployment of this knife is my absolute favorite feature. While the Sampa is not spring loaded for an auto assist type release, the pivot on this blade features Flavio Ikoma’s own ball bearing pivot system, the Ikoma Korth Bearing System (“IKBS”). The way this system works is that channels have been machined into the blade and handle around the pivot area and a set of steel ball bearings have been inserted. What this does is create a silky smooth deployment and offers a VERY evident lockup once the knife is fully engaged. The Sampa makes use of a liner lock and the lock up is one of the tightest I’ve found on an aluminum handled EDC blade (second only to my Kershaw R.A.M. 1910). The linerlock lock releases easily with the push of a thumb. Once closed, the blade is held in place by a spring loaded ball detent. This is the kind of knife that you can’t help but open and close repeatedly. The smooth action and crisp lockup makes for a knife that is a joy to use. The Sampa is a lightweight and super smooth folding EDC knife. Operation, deployment, and lock-up all come easy with one hand, and the ergonomics are friendly enough to facilitate extensive use of the razor-sharp combo edge blade. Although the clip seems a little flimsy, and the polished handles panels pick up light scuffs in time, I hardly feel like these are deal breakers. This Ikoma Sampa has definitely earned the title of a “gentleman’s tactical folder” and represents another solid offering from CRKT. 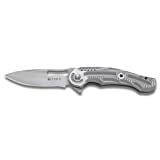 I recommend purchasing the CRKT Ikoma Sampa from Amazon. Please consider that purchasing anything through any of the links on this website helps support BladeReviews.com, and keeps the site going. As always, any and all support is greatly appreciated. Thank you very much. That handle design is way over the top. Way overdone. Baroque. Trying WAY too hard. Not so sure about the “gentlemans-” bit, I’d still feel quite silly using this at my friends oldests’ Bar Mitzwa (you know what I mean). Serrations and black blades have no place on most knifes, especially not gentlemans knives. It’s practical but so are new balance running shoes – you use neither with a nice three-piece (or indeed a dinner jacket). Other than that it seems like the first CRKT in a long while that I’ve felt a yearning for. I’m always happy when a big company gives a smaller designer a chance to shine on the mass-market, that’s how all the great names got started once upon a time. I look forwards to more from mr Ikoma in the future. Although I haven’t handled this one personally, it looks like a sturdy design. Wouldn’t mind seeing one in person. Appears to be a very capable little knife! And yes, it’s great to see CRKT working with interesting international designers like Mr. Ikoma. Take care. I kind of like the design. Being a disabled veteran i have difficulty with the weight and ease of assisted opening knives. I have several steel assisted opening knives butnfor one reason or the other i have not been very happy with them. Good review and nice knife. I like what it has to offer the casual user. Hey Dean, thanks for stopping by! I can’t take the credit for this review (which feels strange), but I agree that this knife does have a lot to offer! Beautiful new knife. Handle look way cool. It’s a shame to keep it in your pocket. it appears to be a quality knife at a competitive price. i’d like to receive one as a free gift in order to test its actual hand held functionality thanks. Michael I wouldn’t mind checking this one out myself! Thanks for stoppin by! I am a knife collector and have handled a lot of knives. This one is light, easy to use Left or Right and Spring Assisted knives are Illegal in my State. This fits the bill for my needs!! !